I took my son (11) and daughter (8) to Warner Lake County Park last week for a bit of hiking and exploring and to collect acorns for an art project we had planned for an event. As I parked by the nature center, the kids made a beeline for a set of pine trees they had noticed the minute we entered the lot. Now, those of you who are parents understand the “rush” that comes when your kids exit a vehicle. They immediately take off to explore while you work to unpack and prepare for whatever is coming. Needless to say, when I finally walked over to the aforementioned pine tree area, I didn’t see them anywhere. After hearing several snickers and whispered giggles from above, I located my two children over halfway up the largest pine. I smiled as I realized they understood what it meant to take healthy risks. Yes, one misstep on the journey up or down from this height meant certain broken bones or possibly worse, but my children were building an awareness of their own thresholds - the crossover between comfortable risk-taking and a dangerous kamikaze jump. They knew what they were capable of and pushed themselves a little bit more, but recognized on their own when it was necessary to stop. Nature provides the perfect setting to develop healthy risk-taking habits and boosts self-awareness, self-reliance, and self-esteem in our children. Its playground levels the playing field for all kids because it requires the use of the imagination - something instilled in each of us as youth but lost as we grow. We simply tend to lose our ability to use it as we are conditioned by factors in society and education. ​The world needs thinkers, inventors, explorers, innovators, creators, and doers. We need to give the world what it needs by allowing our kids to become risk-takers, free-thinkers, and challengers of their own abilities. With these freedoms also come the respect of and pride for our natural surroundings. Nature is all-encompassing, and instead of shielding our children from the possible perils of adventure, we must embrace and return to our original roots of learning, connecting, and growing authentically. It started with two simple words: "I'm Bored". I took my two children (ages 11 and 8) on their first hikes of 2018 this past weekend. 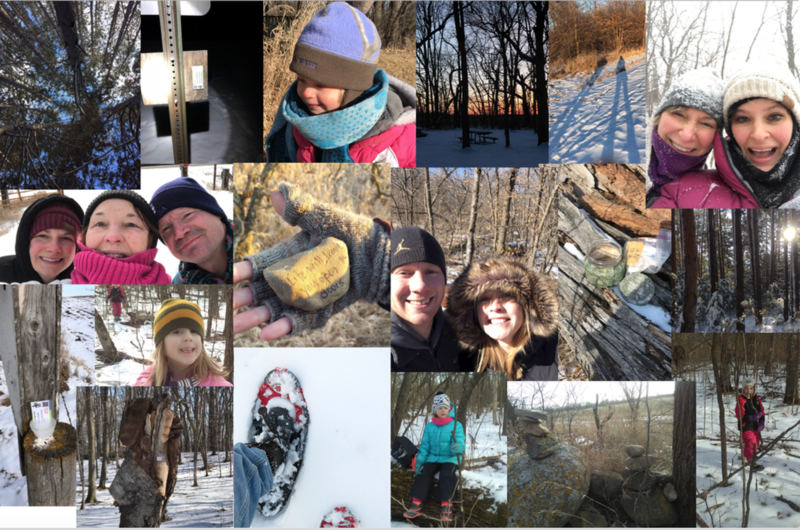 They had developed an interest in hiking and adventured with me throughout the entire spring and summer of 2017, but lost their "oomph" over these past winter months. After a lengthy car ride, complete with two stops for snacks & bathroom breaks and four hours of listening to The Land of Stories on CD, we arrived at the majestic Gooseberry Falls just north of Duluth, Minnesota. Upon exiting the vehicle, the three of us bee-lined for the middle falls and began exploring each in our own way. My son (age 11) proceeded to find as many ways to cross the falls on each level as quickly as possible by climbing, crawling, and leaping his way to and fro. My daughter (age 8) was more interested with taking in each view and detail, and quickly fell behind her brother's attempt at moving through at such a fast pace. After about 45 minutes, my son declared the words no parent ever loves to hear. He told me he was bored, and had already crossed the falls in every way possible. It occurred to me that he had been reprogrammed to expect busyness as the norm, and in the process lost his ability to be mindful of his surroundings, aware of who he is as a person, and in the moment. I looked at him in that moment before responding and saw the eyes of a curious, innovative, and brilliant young man. I knew he wasn't "bored", but instead had lacked the ability to trigger his imagination, creativity, or stillness that innately belongs to every human. It was at that moment I decided I would not become the savior of feeling boredom for my kids, but instead love them more by letting them figure things out on their own. My response to my son, "Boredom is a good thing, and you have the power to choose how you will see it". He looked at me, rolled his eyes like the pre-tween he is becoming, and began investigating the tree roots that grew in amazing twists and turns among the rocks. He found his entertainment through the challenge of building awareness of his surroundings, and I was pleased to see a smile and wonder return to his face. Giving kids the opportunity to be bored actually benefits them in the long run. According to Dr. Vanessa Lapointe, R. Psych., "Children need to sit in the nothingness of boredom to awaken their own internal drive to be". When we share a list of options for them to choose from, we are denying our children of a significant learning opportunity - one that strengthens their own minds to become independent or discover themselves a bit more deeply. Letting our children be bored is a GOOD thing, and now that the summer break is upon us, it is crucial that we remember it. to Cultivate Well Rounded Kids. Have you ever heard the saying, "Not all classrooms have four walls"? ​but not ANY classroom! This classroom eliminates more than the walls of a brick & mortar school. It transforms such things as teacher-led instruction into learner-centered conversation and development. Instead of giving kids problems to solve, it encourages them to build awareness and identify problems on their own by asking questions, evoking a more personalized approach. It raises the relevancy of children's designs & creations because what they produce is exhibited in a public forum FOR the public!. And that's just the educational standpoint! Park Play also incorporates physical movement and exercise each day through hiking, team-building games, and other activities. It's PHYSICALLY good for kids! ​Not only that, but the fresh air and natural environment that surround our camps boosts emotional awareness, so it's MENTALLY good for them too. Add in the fact that we highlight healthy risk-taking on a daily basis, and you've got yourself one incredibly powerful learning and growing opportunity for our kids. Learning Architects Design & Create For Kids! As a learning architect for HIKEhoppers, each and every learning experience is designed around the philosophy that in order to grow, the needs of the whole child must be met. We've created opportunities that not only embed state standards, but also draw from professional training and research on child development and best practices in education. We know kids need space to explore and imagine, to feel safe in asking any and all questions, to be given the "thumbs up" to try something new and different, and to know their ideas and contributions to our community are equally valued by all. In the beginning, it was all about getting people outdoors during the winter months - providing the community with an incentive-style event that drew out those who wouldn't even think of stepping outside if the temperatures dropped below freezing. We quickly discovered that Park Blast not only got people outdoors. It crafted the most exquisite stories of those moments we hold forever in our minds and hearts, and I was one of the lucky ones who heard some of these stories. One of my favorites comes from Erin Pluimer, who is no stranger to the outdoor adventures. My name is Erin and my husband, Enik, and I are originally from Milaca. My love for hiking began when our family got a golden retriever while I was in high school. I loved taking our dog Haley to the Milaca Hiking Trails near the Rum River. Enik and I were good friends beginning in middle school and often hung out together. We did not start dating until after we graduated in 1997. Much of our dates included outdoor activities such as biking, hiking, rollerblading, cross country skiing, and camping. Erin & Enik used their passion for the outdoors to create action with their family. While our kids were young, we enjoyed GeoCaching. They would have a blast holding the GPS and being led to countless containers of swag. They loved opening the cache, dumping it out and trading while my husband would sign the log book and I kept a lookout for muggles. We discovered so many unique places in MN that we would have never known about before! We participated in the Park Escape at Wildwood/Kraemer Lake over MEA weekend. The Escape was a lot more challenging than we had expected, and the park was a beautiful backdrop to a fun family adventure. When I saw the Park Blast advertised, I knew it would be another great opportunity to get outside, log several thousand steps and a chance to find clues to some great prizes from local businesses. I'll admit that I'm not a huge fan of winter so I sent my husband, Enik, off to Mississippi County Park on his fat bike with the first clue. He found a few codes that evening and sent me pictures. A few days later, he and our 13-year-old daughter, Allie, went cross country skiing and came back empty handed. The second set of clues were sent shortly before Valentine's Day and Enik and I decided to go out for an evening hike. We had headlamps and flashlights and hit the trail. It was a calm evening and it was so fun to try to search the trails. We were nearing the end of our date and had not found a clue yet. We were feeling a little bummed and sure enough, Enik spotted a clue stapled to the back of a tree. It was so exciting to find one, I didn't even care what the prize was! The following week we invited by brother-in-law, my 6-year-old niece and their yellow lab, Kobe, to join us. It was so fun to see the excitement of my niece when she found her first code. We won a lot of amazing prizes. Our favorites include a homemade Yard Jenga that we plan to bring to our cabin this Spring. We also won tickets to the Irish band "We Banjo 3" at the Paramount Theater. We had an amazing time at the concert and have been listening to their music ever since! Park Blast provided us a chance to not only win some great things generously donated by local businesses, but a renewed love for the Great Outdoors. I think we're so fortunate to live in Central MN where there are so many wonderful gems waiting to be discovered! Thanks again HIKEhoppers! We look forward to registering our younger son for summer camps you'll be offering this summer. We also look forward to more adventures with you! As the school year winds down, community education brochures and advertising for summer camps grace the mailboxes and inboxes of families across the nation. Parents begin to choose activities, hoping their choices will offer experiences that promote deeper learning and engagement for their child. But how is a parent to choose? From S.T.E.M (Science, Technology, Engineering, and Math) to theater to sports, there are a variety of options available, and it's up to us to find the right fit. Enter Park Play Outdoor Camps. We take play in the parks seriously. and inventors using the natural world. From engineering a natural playground to creating art pieces for a "Museum of Natural Art", Park Play Camps join experiential learning with a child's ability to imagine and invent. From designing "escape" trails to constructing natural trail markers making paths easier to navigate, each camp allows kids to ideate, research, and develop contributions that are exhibited to and offered for public use and enjoyment, making them contributors to their community. Watch for Park Play Camps to be offered in your district's Community Education Spring/Summer Catalog, and/or in our monthly newsletter, and on our website! Each themed camp will be offered twice throughout the summer to allow for choice and flexibility for your family. My kids had the last three days off, and the forecasted "high" temperatures hovered around zero...on the warmest day! I spent much of the first part of the weekend reading with them, reading to them, playing board games, dolls, school, and even had a "Spa" set up for the full works of pampering. However, all of these activities merely brought us to Saturday night! From then on, my children decided that the living space would be better served as a wrestling ring, or that our floors were "lava", and that they needed to do everything in their power to walk across and climb on all furniture to avoid stepping on it. There comes a time when you have to decide whether you want to continue to search for "inside" activities for the family to enjoy, or whether it is in the best interests of both you and your children to send them outside on a cold day. I, for one, was always concerned about frostbite on my little ones. Don't get me wrong, I still am, but this weekend I chose to teach my children how important it is to layer and bundle. I chose to teach them how to listen to their own bodies to decide when enough was enough of being outside. I chose to empower my children to read themselves, to read their environment, and to practice responsible adventuring. Needless to say, my kids were out for over an hour. They made designs in the soft powdery whiteness in our backyard. They traced tracks around and across the perimeter of our yard to play tag on, and even tasted handfuls of - thoroughly checked - frozen goodness when they were thirsty. When my youngest came in, she reported that it wasn't the cold that forced her in, but the fact that she was left out of a football game which started as soon as the neighbor boy came to play. My oldest, who is normally the one to retreat to his warm cave rather quickly, spent the majority of the day outside. He played football and boot hockey, and was asked to come in when our family was ready for dinner. So get those kid outside to explore, adventure, and be "entertained" by the natural excitement that builds when outdoors. Don't forget that the excitement of the outdoors also builds when you model it for your kids. Get out there yourself. Bundle up and wear layers. Take time to adventure in the outdoors when the temperatures are not in your favor, but the crispness of the air and the stillness of the trees and forest floor offer a beauty unmatched in any other season. 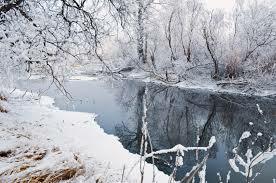 There comes a time when we must realize that winter provides an untapped serenity and beauty for those of us ready to discover it. Winter. It's here, bringing the cold temperatures, strong winds, and dare I say it - SNOW. I know plenty of people that comment this season is their least favorite because of the aforementioned elements, and I can honestly say I often agree with them. But then I think of the mood I am in when I am conditioned to enjoy warmth only, which is predominantly found indoors during this time. I become sedentary and somewhat lethargic. I see strong emotional mood swings in my own children as we hunker down inside for days without journeying out into our natural environment. We begin to fill our time with puzzles, family board games, and TV - all activities that do anything BUT get us active​ or reconnect us with nature. So how can we fulfill our wishes to stay warm and cozy AND reconnect with nature on a consistent basis through winter? Bundle up and wear layers. Invest in good quality outdoor attire. It's that easy. The choice between a little chill (even when dressed appropriately) and mental, physical, and soul-pressing stress seems fairly obvious when we dig down to the consequences involved with the decision to stay indoors or venture out. I made the choice to take my children on a winter hike in a snow-laden park. Even though we were all adorned with our ultimate snow gear, my son, who is an avid climber of any fallen tree, ended up getting snow in his boots. He began complaining of having cold feet halfway into our 4-mile hike, and made it only a few hundred more feet before his attitude about our expedition started getting sour. So what did I do? I stopped and sat next to him on a stump, and the two of us helped him exchange his wet socks for one pair of fuzzy insulated socks I had on. From that point on, he was back to his explorer-self, and I beamed with pride knowing that I had prepared for something I didn't anticipate happening, and it saved the experience for us all. Don't be afraid of winter. Instead, welcome her by preparing to battle the elements so that you can continue to strengthen your body, calm your mind, and feed your soul. Nature always calls. Winter is her way of challenging us to do what is right and good for our own well-being. How often do they play outside? And for how long? When given a choice, would these children choose to do an inside activity or an outside one? 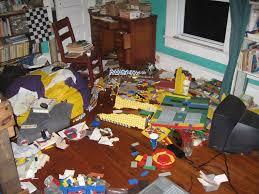 When given an ultimatum such as, "Do your homework/chores or go outside," do these kids choose the former option? If you found yourself offering up sub-par answers, know this: You are not alone. This generation of children are losing their sense of wild, thereby earning the title, "The Lost Generation". Finding ways for youth to reclaim their connection with the outdoors is easier than you think. Thanks to the efforts of organizations and passionate outdoor enthusiasts, there is evidence that kids are getting outdoors more. With growing opportunities to enroll in outdoor preschools, camps, and classes, it is becoming easier for kids to journey back into nature. 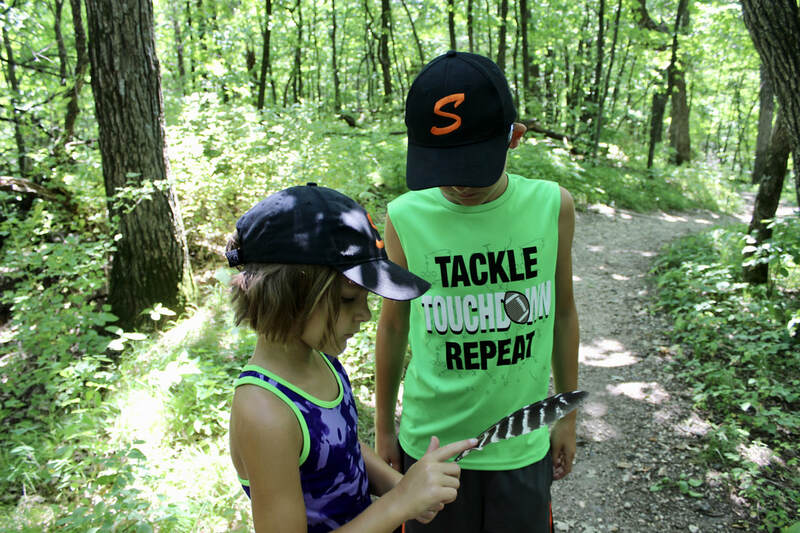 Government entities are also doing their part to get kids and their families outdoors, educate them, and offer experiences that bring the deep connection of humans and nature back to life. But even with entities providing opportunities for children and their families, the movement to regain our connection to nature lies within each of us. When we rediscover what it means to spend time outdoors for ourselves, we innately transfer this discovery to our children. When we model enthusiasm for reconnecting with nature, our children adopt - and develop an ownership - of this same mentality. It's time to join the movement of reclaiming what was once lost - our connection to the outdoors. When we rediscover this essential connection, we will no doubt pass along the value of nature to our current generation of children. And when our children find their own personal relationship with nature, they will be more apt to participate in conservation and appreciation efforts. As Sir David Attenborough so eloquently stated, "NO ONE will protect what they don't care about; and no one will care about what they have never experienced." Let's breathe life back into these lost boys and girls by offering experiences in the outdoors. 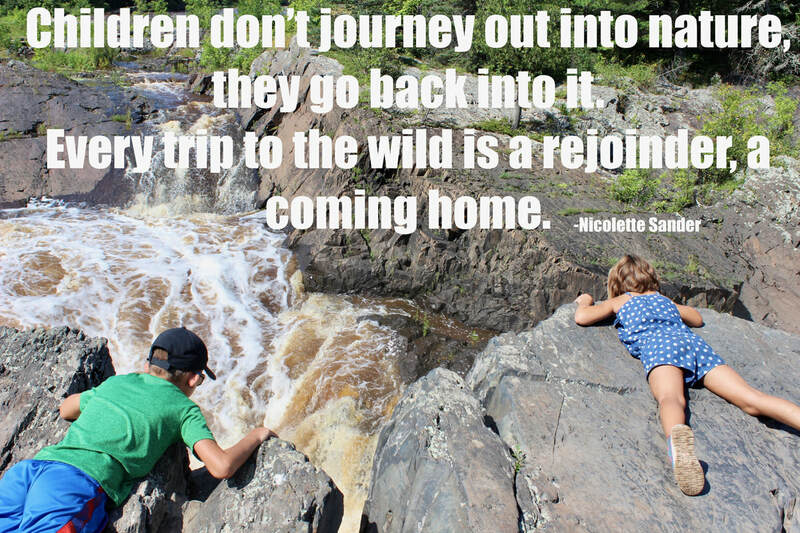 Let's bring back the wild in our children. We are a community of hikers committed to helping people find a healthier version of themselves.